The French for overheat is the regular ER verb surchauffer. 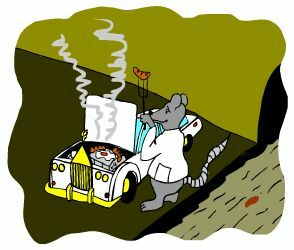 To remember imagine a SEWER CHAUFFEUR overheating his breakfast on the boss's car engine. A French cartoon memory trigger will superheat your memory and your ability to recall new French words. Chauffer means to heat something up, to warm something up. Again you can imagine a CHAUFFEUR heating up his breakfast on the engine of his master's car. "BAKIN' ROLLS anyone?" Oh la la! The boss will not be happy! overheat! surchauffe ! surchauffons ! surchauffez ! ⇒Surchauffer is a regular ER verb conjugated in exactly the same way as thousands of other regular ER verbs. ⇒Learn surchauffer and it will reinforce the pattern for ALL those other ER verbs. ⇒ They feature French verbs like the French verb surchauffer - French for overheat. ⇒ You can more easily remember words like the French for overheat - surchauffer using the techniques of the world's Memory Masters. 200 Words a Day! Free Daily French Lesson Online - the verb in French for overheat is surchauffer - fully conjugated.